It will come as no surprise to learn that this month's news will be centred on a visit to a certain London Palace to receive a certain gong! Hilary and I had been looking forward to March the 7th ever since we were informed of the date, and spent quite a while preparing ourselves for the visit and getting as much info as possible on the etiquette of it all. 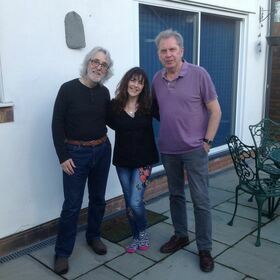 Fortunately our dear pal Roger Bucknall had been there a couple of years back and was able to give us a few pointers as to what to expect. Our dear pal Carrie Martin who everyone should know by now was the person who created this award and spent a good three years working on it and husband Darren wanted to be there on the day with us, which I thought was very fitting and very lovely. We booked into the same hotel the night prior to the event (obviously) because we had to be there by 10-am that morning. 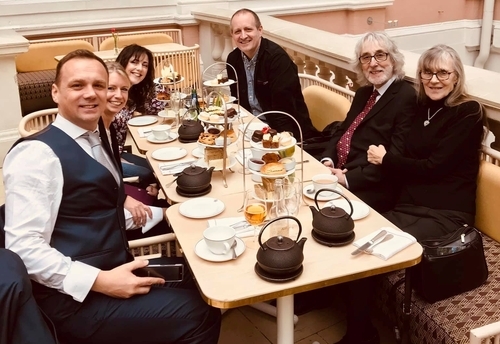 I had purchased a posh suit (well, posh for me) and Hilary had sorted out what she should wear and decided on a small "fascinator" for the event so that was all fine. 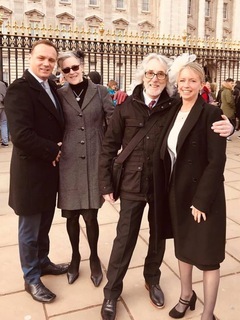 My daughter Sadie and her partner Gordon would be with us in the Palace for the presentation and they too travelled down the night before and booked into a hotel not far from ours. We all met up the following morning outside the palace gates looking suitably dressed for the occasion. I was at that time beginning to feel a tad nervous but in a nice way. Anyway after showing our invites and ID we were allowed into the Palace grounds and eventually into the Palace itself. Hilary and I weren't complete newcomers to the Palace having attended a garden party there a few years previous courtesy of the Grand Order of Water Rats, so we sort of had a feel for the place. When we arrived inside the Palace, recipients were separated from their guests and were ushered into an adjoining hall pretty close to the main hall where the presentations take place. In the room we were in there was a large TV screen showing the live action that was happening in the main hall, and to witness a Knighthood being awarded was something to behold. We were joined by a very elegant military man of great dignity and humour who briefed us to what was to come. The Royal personage presenting the honours that day was HRH PRINCE CHARLES. The elegant gentleman told us that men had to nod their heads on facing the dais where HRH was presenting the awards and when signalled we then approached the great man. On reaching HRH you were told to address him as "Your Royal Highness" The whole of this works like a well-oiled machine. When awaiting your turn you are announced by a gentleman on a rostrum, next to him is a gentleman with a clipboard who whispered to the prince a brief bit of info about the recipient and what the award was for, so when he finally speaks to you he has some idea of who you are. When my turn came it all went well. He said to me “I believe you are a great guitarist" my reply was "I do my best sir" He then asked me if I was still busy with my music and I informed him that "yes I was still busy and in fact I had played for his father once as a member of the Grand Order of Water Rats" which he was quite intrigued to hear. He then said “why aren't you wearing your badge?" my reply was that I was told I wasn't allowed to wear it for the presentation. He replied, "Oh, you should have, I have mine somewhere at home". He was charm itself and said the he hoped this award would encourage me to continue. I then shook his hand, took three steps back, nodded, turned to my right and walked out of the hall. A person then takes your MBE off you and places it in a nice box marked MBE. Oh yes I forgot to say the after I said “Your Royal Highness” he then places the honour on to a special clip made for the job. Just as we were about to leave the great hall after all the awards had been given out a rather tall gentleman appeared at my side and said "FEAR OF THE DARK" I of course smiled and thanked him for recognising me and for being a fan! Who would have thought that in that situation anyone would have known who I was! 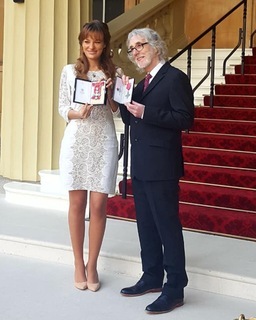 We then had to join in line for the "official" photograph outside and whilst waiting there who do we meet but Nicola Benedetti the great violin virtuoso who had been presented with an OBE to add to her MBE! Such a charming and lovely person who agreed to have a picture taken together, but the one featured here was taken by my Sadie and I personally think its lovely so well done Sadie for capturing that moment. 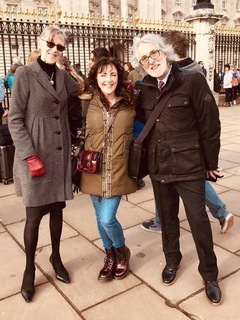 Once outside the palace gates Carrie and Darren were there to greet us with huge smiles along with our dear pal Geoff Olner who had turned up to surprise us. It was Geoff who took that lovely snap of Hilary and me displaying my MBE. We then got a taxi to The Wallace Collection for afternoon tea. 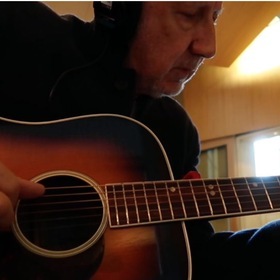 Whilst there I received an email from Pete Townshend telling me that the Levin guitar I had gifted him and featured in last month's news impressed the great man so much that it inspired him to use it on a new composition for the Who's new album. Such a fantastic way to finish off one of the most memorable days of our lives. 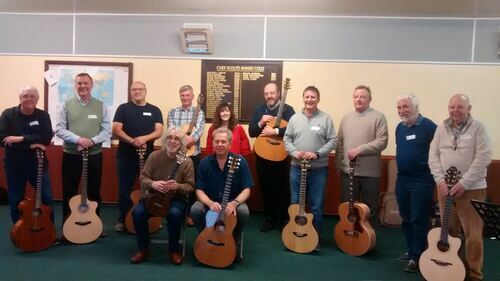 My special guest on my last Sharing Day on 16th March was that lovely man and great guitarist Ken Nicol. The chosen piece for the day was Fiona's Smile. I started proceedings with a half hour selection of tunes and requests which I think is a nice way to ease into the day. This was followed by a close look in detail at certain sections within the piece. After lunch Ken stepped up to do his thing and answer questions. His lovely old Fylde Ken Nicol signature sounded amazing along with a beautiful Fylde Uke. Probably the best sounding Uke in the world. After Ken's set I invited members of the assembled company to play for us, which is always nice for the players and listeners alike. It was great to see Carrie Martin with us along with Keith Meredith who commissioned the chosen piece for the day for his beloved Fiona. The special certificates I created for the participants were warmly received. 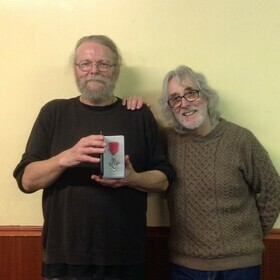 Special thanks to Malc Welch -seen below with my MBE - for the catering and photos and Karen Boulton for the transport. The special certificates I created for the participants were warmly received. Here's to the next one at the charming Castle Park Arts Centre, Frodsham, Cheshire on 6th July. My special guest for the afternoon is that outstanding guitarist/teacher/ composer Martin Pleass. 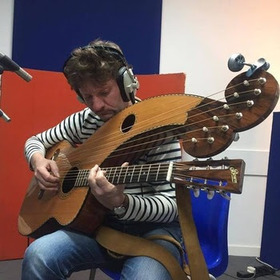 I'm hoping he will be bringing that amazing Ralph Bown harp guitar along and demonstrate his skills on this monster of an instrument. Martin also has some impressive connections with world famous legends and I look forward to hearing about them on the day! The chosen piece for the day is A Christmas Carol. The evening will see me perform an intimate concert in the upstairs gallery. Opening the evening concert for me will be the superb builder of bespoke electric guitars Michael Gough of MG GUITARS. All Sharing Day bookings, or enquiries should be directed to Sue Holton via ggiltrap+sharingday@gmail.com not the Arts Centre. 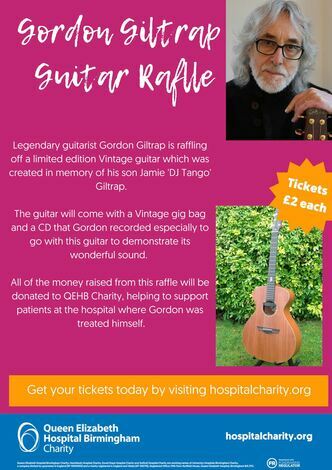 Here is a chance for you to win a guitar and also to contribute to a worthwhile charity for The Queen Elizabeth Hospital. All the details are on the poster, and at £2 a ticket you can't go wrong. My recent gig at The Wurzelbush folk club was an interesting one, I rarely play at Folk Clubs these days. I met some lovely folk on the night and the audience was a delight to play for and very respectful and receptive. Here is a fantastic picture of Pete Townshend playing that lovely old 1966 Levin I gave him. If you visit the site using the link below you can hear him playing it.